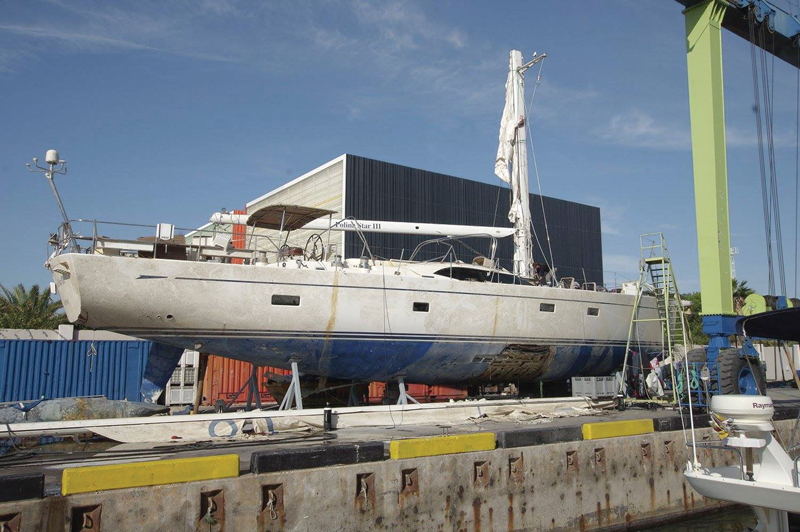 With the 2015 sinking of an Oyster 825, U.K. boatbuilder Oyster Marine sank as well, into administration, and then was salvaged this year by Richard Hadida. Last March, British entrepreneur Richard Hadida, 52, bought beleaguered Oyster Marine, which had been in administration only since February, a result of the Oyster 825 Polina Star III sinking off the coast of Spain in July 2015. It’s an interesting story, described in varying specificity online. According to Captain Alessio Cannoni’s Wavetrain account, he and one crew were sailing the yacht off the coast of Spain on a sunny day in 18 knots of wind with 1.3m (4.3′) waves when suddenly there was a “strong noise with vibration from the hull” resulting in “big flooding in the engine room” and “water over the service batteries; all systems KO.” The yacht bore away, emergency bilge pumps activated, life rafts and ditch bags readied, and Mayday calls issued. Just six minutes passed before the keel “disconnected completely and the boat capsized.” Captain and crew were rescued a few hours later by a fishing boat. The 83′ (25m) yacht capsized and sank after losing its keel while sailing off the coast of Spain. 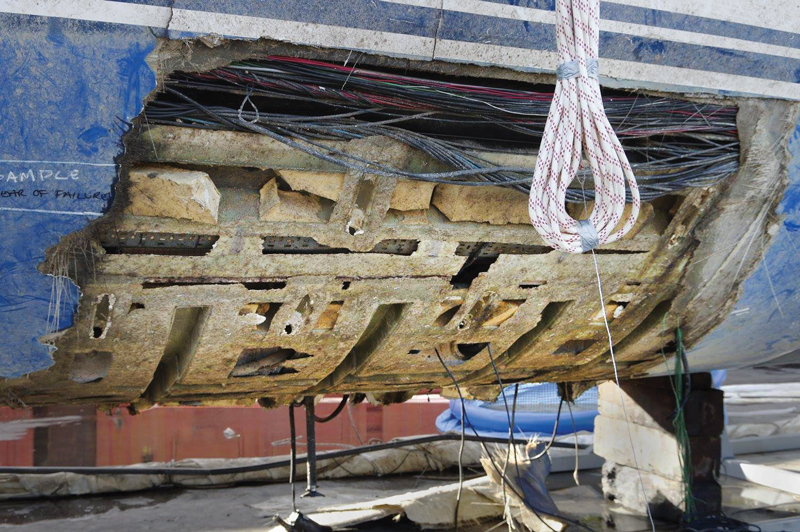 This photo shows how the entire hull laminate in way of the keel was torn away. In February 2018, the Russian owner of Polina Star III went public, creating a website to tell his side of the story, which makes serious accusations against Oyster Marine. Former Oyster CEO David Tydeman later stated that he attempted to make a deal with the yacht owner to build him a new yacht, but that effort was unsuccessful. The owner’s insurance company covered costs of the yacht but not associated costs of outfitting, crew, and distress. Despite an £80-million order book, the company filed for liquidation, stating only that it had been unable to secure the necessary financial support to continue, and also announcing the termination of 400 employees. With Hadida’s purchase of the firm that does business as Oyster Yachts, positions are being filled to complete the 26 hulls in varying stages of build. Kim Stubbs, credited with helping another British yachtbuilder, Sunseeker, regain profitability, was brought on board, and the services of designer Rob Humphreys were retained.